Last week on Friday, it was a farewell / "see you later" to Miss Clark. 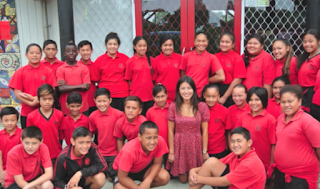 She has taught in Year 7 and 8 for the past three years and is off to work in a different career path altogether. We will miss her and wish her all the best for the future. Here is a short snippet of our senior children singing a waiata (song) for her during assembly.